Global Media18 is undertake work of leaflet insertion through in Newspaper. Leaflet insertion & distribution is very cost effective & good medium to reach target media. 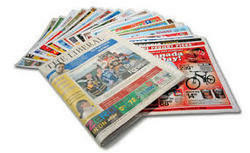 We cover Pune's all location and do leaflet insertion in all leading Newspaper fo Pune. We have done already 100 leaflet insertion & distribution work in Pune from top brand & service company. You can get in touch with us for leaflet distribution & insert service in Pune. Global Media18 was established in the year 2012. We are offering Services regarding Advertisment whatever your advertising need we will give you the best solution. Global Media18 having more than 2 year experience in advertising. We do branding throgh Print Media, OOH, Indoor Media, Cinema, Radio, etc. We represent some of the worlds most popular and well-known titles reaching a huge global audience of readers from fashionistas through to travellers, businessmen and politicians.